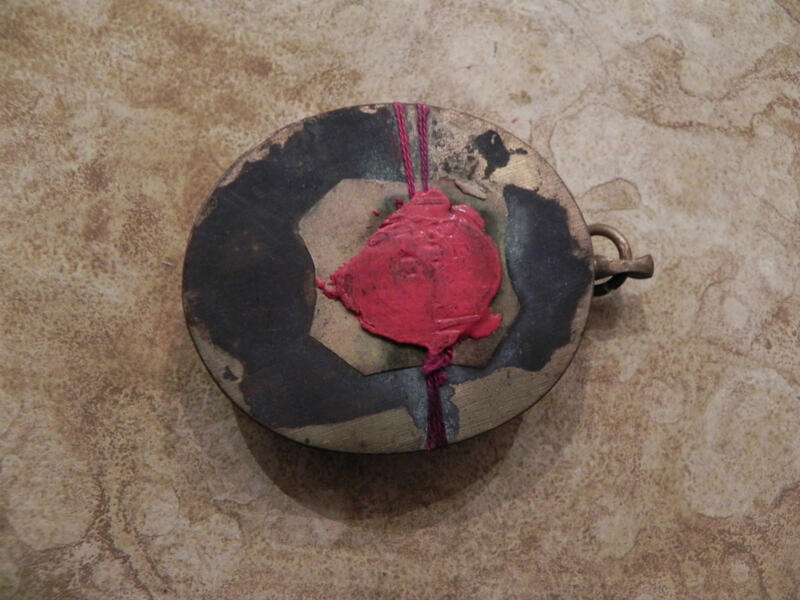 The artifact featured here is an oval reliquary measuring 52 X 46 cm, with a relic of the original Chair of St. Peter enclosed in glass, with sealing wax and silk threads intact. 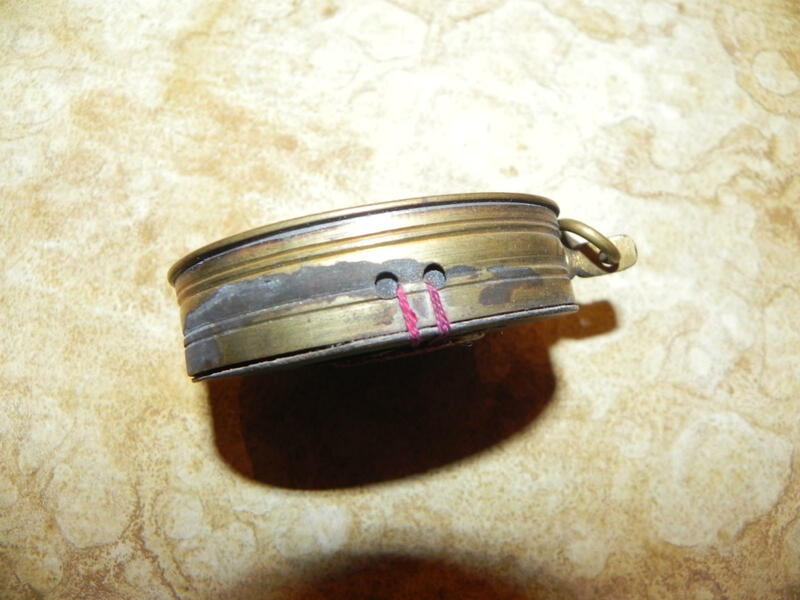 The wax seal and unbroken threads authenticate the relic, as does the document of authenticity accompanying the item. The image of the papal cross keys & tiara are what drew the Curator to this particular item. As can be seen in the photo, the original throne is decorated with small carved ivory plaques showing the labors of Hercules and some celestial constellations. The chair is actually visible through Bernini’s canopy. An ancient tradition holds that the Apostle himself sat upon it during sermons. However, the archaeologist G.B. De Rossi, who was able to examine the venerable relic during one of the centenary festivities in 1867, the last time that the Chair was put on show, concluded that only the acacia wood skeleton dates from the early age, while the other parts in oak, anchored to the skeleton by strips of iron and the ivory plaques, belong to a re-construction of the Chair made in the Byzantine period. This reliquary is thought to be the original acacia wood dating from the time of St. Peter himself using the chair. Every year on February 22, the Church celebrates the feast of the Chair of St. Peter, to commemorate St. Peter’s teaching in Rome. Already in the second half of the 18th century an ancient wooden chair inlaid with ivory was venerated and traditionally held to be the Episcopal chair on which St. Peter sat as he instructed the faithful of Rome. 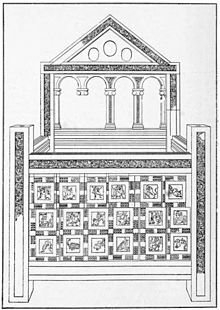 In fact, it is a throne in which fragments of acacia wood are visible, which could be part of the chair of St. Peter, encased in oak and reinforced with iron bands. Several rings facilitated its transportation during processions. Pope Alexander VII commissioned Bernini to build a sumptuous monument which would give prominence to this ancient wooden chair. 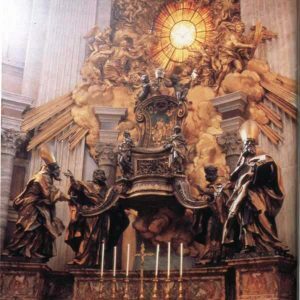 Bernini built a throne in gilded bronze, richly ornamented with bas-reliefs in which the chair was enclosed: two pieces of furniture, one within the other. On January 17, 1666 it was solemnly set above the altar. 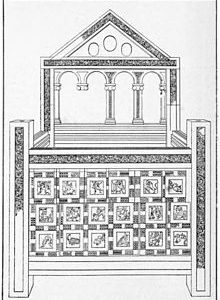 The base of the altar is made of black and white marble from Aquitaine and red jasper from Sicily. Four gigantic statues (about 5 m. tall) in gilded bronze surround the Chair which looks almost as if it were suspended amidst the clouds. The two outer statues are figures of two Doctors of the Latin Church: St. Ambrose and St. Augustine; the two inner statues, with bare heads, are of two Doctors of the Greek Church: St. Athanasius and St. John Chrysostom. These saints represent the catholicity of the Church and at the same time, the consistency of the theologians’ teaching with the doctrine of the Apostles. 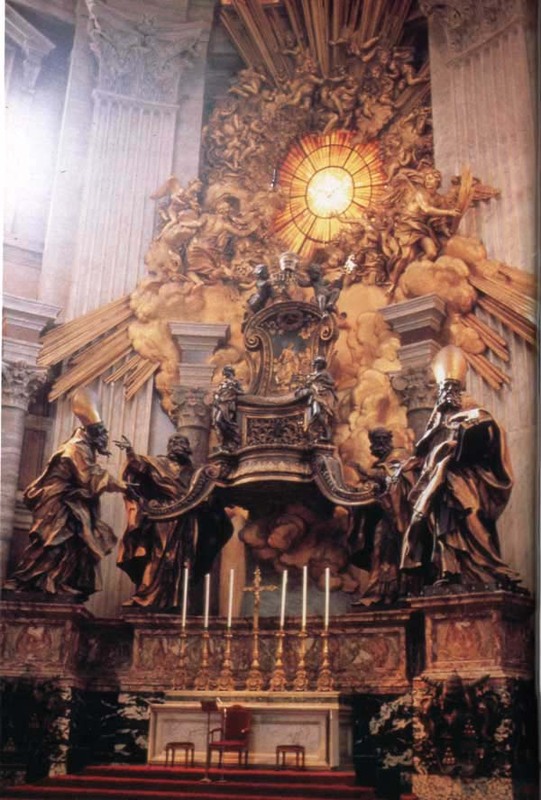 Above the Chair are two angels bearing the tiara and keys, symbols of the Roman pontiff’s authority. On the Chair, are three bas-reliefs picked out in gold, which refer to the same number of Gospel episodes: the Consignment of the keys, Feed my sheep, and the Washing of the feet. The whole composition is crowned by the fantastic gilt and stucco Gloria peopled by a host of angels among rays of light and gigantic billowing clouds. In their midst is the precious window of Bohemian glass, divided into twelve sections as a tribute to the Twelve Apostles; a brilliant dove stands out against it, the symbol of the Holy Spirit, the soul of the Church which he never ceases to help and to guide. Vanvitelli decorated the vault with gilded stucco. 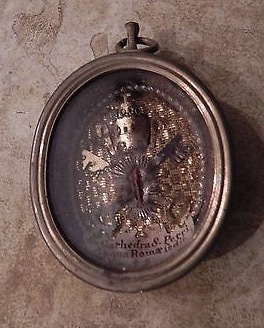 In the three medallions are portrayed: the Consignment of the Keys, the Crucifixion of St. Peter and the Beheading of St. Paul.